Nov 11, 2007 in "Cinderella's Holiday Wish"
LAKE BUENA VISTA, Fla. -- A dazzling new lighting spectacle is transforming the iconic Cinderella Castle at Walt Disney World Resort into a glimmering, shimmering ice palace at holiday time. Bathed in more than 200,000 tiny white lights, the castle glows and glistens as "Cinderella's Holiday Wish" delights Magic Kingdom guests nightly, starting Nov. 12. "We are thrilled to be adding this brilliant new castle spectacle to the holiday festivities at Walt Disney World this season and for seasons to come," said Francois Leroux, vice president of Walt Disney World Entertainment. "This glistening holiday enchantment creates perfect fairytale magic for this festive time of year." "For a park aglow in holiday magic, this becomes the new and eye-filling superstar," added Disney Entertainment show producer Rob Hamberg who supervised the weeks-long rigging of the turrets and towers for the light show. "Nothing will rival 'Cinderella's Holiday Wish' for sheer visual spectacle." As if suddenly dusted in a million ice crystals, Cinderella Castle shines like the galaxies, adding to the wintertime wonderment of the holidays at Florida's Vacation Kingdom. To mirthful holiday music, Mickey, Minnie and the gang appear onstage, admiring the festive lights illuminating Main Street, U.S.A. But what to do about the darkened, unadorned castle? As they bandy about ideas, the Fairy Godmother suddenly appears. It is Cinderella who should rightfully decide, she insists. Enter the princess herself, with her Prince Charming. All agree with Cinderella that her castle should sparkle the way her beloved glass slippers do -- like shimmering ice and snow. With a wave of Fairy Godmother's wand -- and guests joining in to make the wish come true -- Cinderella Castle magically morphs into a glorious wintry confection, twinkling in the sky. "The castle suddenly shines like a glistening blanket of ice," explained Disney show writer/director Alan Bruun. 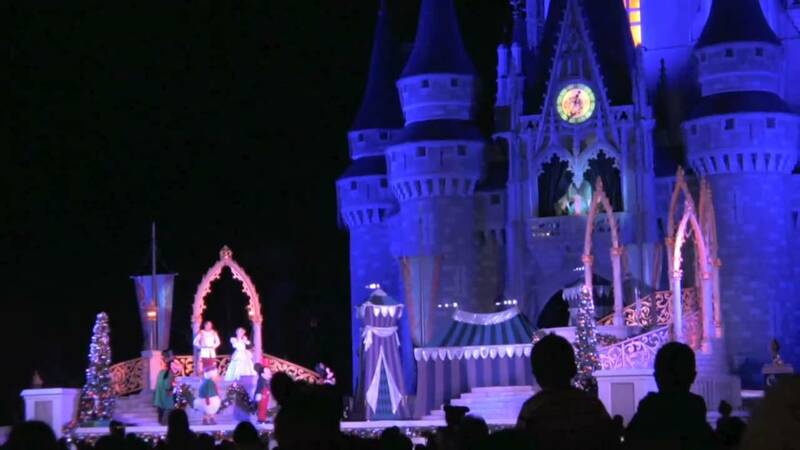 "Guests won't believe their eyes at the spectacle as Cinderella's holiday wish comes true." Show times will be nightly at 5:45 p.m. Cinderella Castle aglow will also play a supporting role in other Magic Kingdom entertainment such as live stage shows, the nighttime fireworks extravaganza "Holiday Wishes," and the after-hours Mickey's Very Merry Christmas Party, a specially-ticketed event featuring the new "Mickey's Once Upon a Christmastime Parade." Like a global necklace, dazzling castle lighting spectacles also adorn Disneyland Paris, Hong Kong Disneyland and Disneyland Resort. Disneyland Paris, now marking its 15th anniversary, started the castle lighting tradition in 2005 when Leroux conceived the concept.